Bring your family and friends to deluxe furnished condos, cabins and vacation homes on the shores of Flathead Lake. Enjoy the scenery and panoramic views of the lake and the Rocky Mountains. 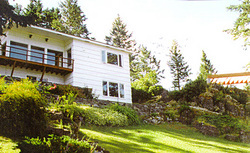 Conveniences include fully equipped kitchen, microwave, washer/dryer, cable TV, balcony hot tub. Heated pool and boat docks at the condos. Year-round resort close to Glacier National Park. Less that an hour to Big Mountain Skiing and numerous golf courses. Children are welcome. Condos and homes are roomy and affordable for most. Groceries, deli and restaurants nearby. Directions: The office for Montana Vacation Rentals is located in Lakeside, Montana. All homes are located on Flathead Lake. Please call for directions. Take all highways to Flathead Lake. Drive on Highway 93 to Lakeside, then turn at flashing light towards lake and follow road 1.5 miles then take a left at Peaceful Lane. Turn left at the sign then continue six doors past tennis court.